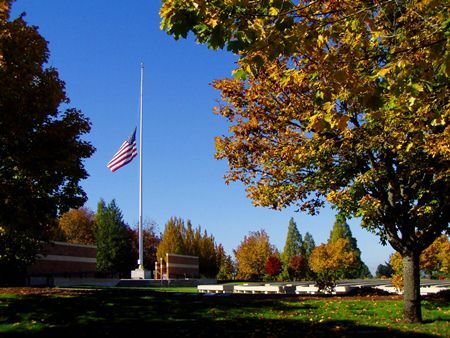 My dad has a veteran’s plaque at Willamette National Cemetery. This week I went to Jenny Milchman’s reading. She was our guest a few weeks ago (post here). Afterwards, hanging out with Jenny and another fabulous author, Johnny Shaw, we got to talking about the promotion and marketing side of our biz. Johnny said he considered it part of his job, like a woodworker sweeping up his shop at day’s end. We may not like some chores, but we gotta do them. Years ago, my dad said the same thing to me, and it was a huge lesson in what it means to be truly devoted to a cause, whatever that cause may be. Because this thing we do, this writing, isn’t just about passion–passion doesn’t last forever. It’s about accepting that any job we love comes with the parts we don’t love–that we may even detest. I remember the day I learned the lesson about sweeping our shops. My dad was an engineer-turned-restaurateur. I worked at one of the restaurants during college breaks. He started me out like everyone else: cleaning shifts and waiting tables in the crappy sections. After a few years, I joined him in his cluttered and cramped office, where every two weeks I’d call hours into the payroll company that generated paychecks. I can’t remember everything this task entailed, but it took all day because I had to go through all the time cards for every employee, tally them up, calculate something to do with tip wages … Not hard, per se, just detail-oriented and error-prone. Me: Hey, Pop, how come you want me to call in the payroll all the time? Pop: <grunt> I don’t like doing the payroll. Never have. Me, all astonishment and shock and disillusionment: But, you love your job. Pop: Ah, but that doesn’t mean I like everything about it every day of the week. You still need to do the stuff you don’t like. Seems obvious now, but I was a black-and-white kid. All or nothing. It had never occurred to me that I might dislike aspects of any job I would eventually choose as my career. Talk about a revelation. I was disappointed to learn about this slice of adulthood, but it also opened my eyes to the notion of perseverance. We gotta truck on through the bad bits if we want to enjoy the good bits. This early lesson proved invaluable when it came to my writing life. Peace be with you, Pop. Great advice! My dad taught me the same thing. I used to go to my parents’ dry cleaners and sweep the floors and sort hangers when I was a little kid. I didn’t love doing it but it taught me so much about hard work and the value of a dollar — and I loved having a little bit of spending money for the toy store! Great post today, Lisa! Hi Kristy, thanks! I think small-business owners are some of the hardest working people I’ve ever met. I know I couldn’t own my own restaurant. I don’t know how my dad did it. Your dad was right–no matter how much we love a job, we won’t love every detail, every moment. And that’s OK. It is OK. I’m so glad I learned the lesson early! Wonderful post! I learned that lesson young, as well, but it’s interesting…I had to re-learn it when I became a writer. I think because of what Natalia said and what you mentioned in the article—this job begins with passion and for some reason we feel it should be ALL that in the beginning. But it evolves into a labor of love if we nurture it right. You do what you have to do keep creating stories and to escape into another time and place. I guess all that yukky is worth it in the end? Lovely. Thanks, Heather! Writing is a labor of love, and there’s a reason we use the word “labor” in that old adage, right? If it were only easy, it might not be as worth it.